Hello! Sorry for my long absence from blog land. I just returned home from a 10 day vacation to New York State, Vermont, and New Hampshire. I had a wonderful time and will have many posts and stories to share in the near future. For today though I just have another simple, yet colorful and fun card to share. My sketch is from Splitcoaststampers (SC353), the paper is K & Co Confetti Designer Mat Pat, and the main image is a K & Co three dimensional sticker. Gotta love those stickers...they are so pretty you don't need much else to make a lovely card. 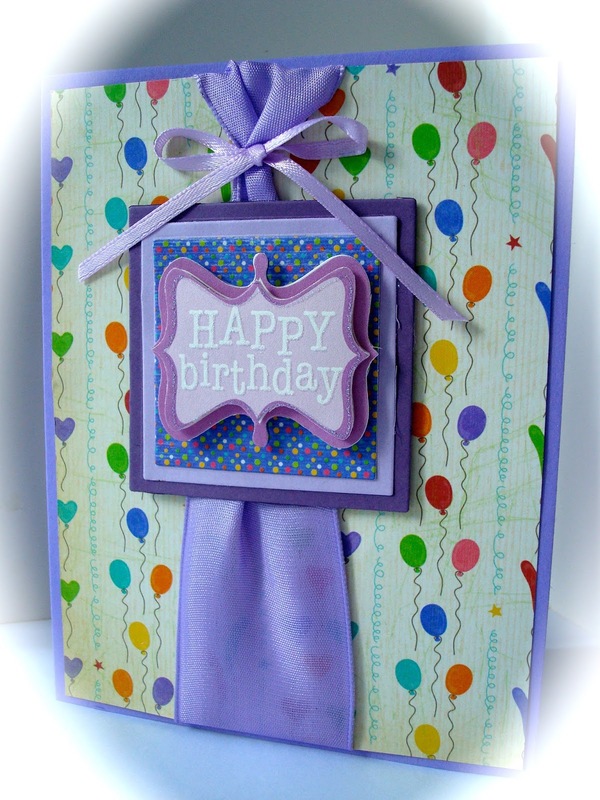 I used some wide purple ribbon for the second layer of the card, tying it with a smaller purple ribbon. Fun card! The bow & ribbon are especially lovely. Great sticker too. Great card! The ribbon &bow are especially pretty. Love the sticker too. This is a wonderful card, fun and elegant ! Love the big ribbon ! It's beautiful Amy! I love how you tied the wide ribbon with the smaller one! Can't wait to read about your vacation! Wonderful card and nice color combination! I love the ribbons you've used! Oh how beautiful Amy!! I just love your colors, the sparkle, the layering of the sentiment and the ribbon treatment! !